American journalist and newspaper publisher and proprietor; born March 12, 1858, at Cincinnati; educated at the common schools of Knoxville, Tenn. From 1869 to 1873 he was employed as carrier-boy and "devil" in the office of the Knoxville "Daily Chronicle"; he then became a practical printer, and in 1875 removed to Louisville, Ky., where he obtained employment in the job-office of the "Courier-Journal." Here he remained for a year, and then returned to Knoxville, where he entered the composing-room of the "Daily Tribune." In 1877 he removed to Chattanooga, where he accepted a position on the then newly established "Daily Dispatch." 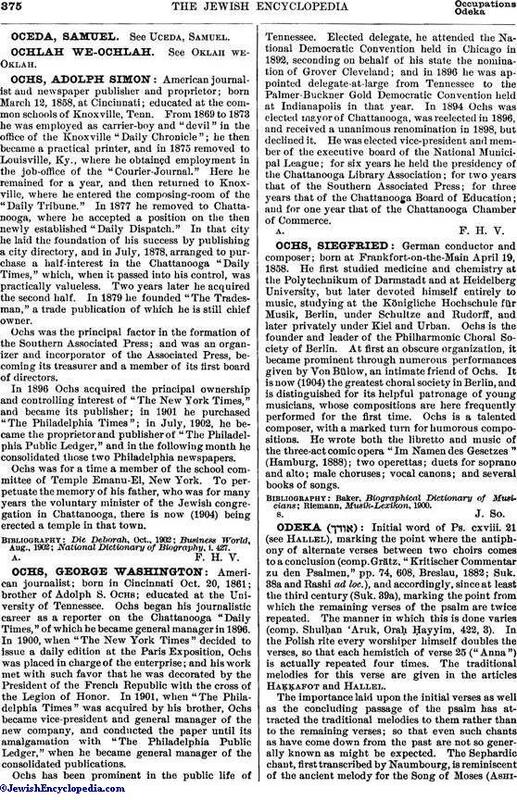 In that city he laid the foundation of his success by publishing a city directory, and in July, 1878, arranged to purchase a half-interest in the Chattanooga "Daily Times," which, when it passed into his control, was practically valueless. Two years later he acquired the second half. In 1879 he founded "The Tradesman," a trade publication of which he is still chief owner. Ochs was the principal factor in the formation of the Southern Associated Press; and was an organizer and incorporator of the Associated Press, becoming its treasurer and a member of its first board of directors. In 1896 Ochs acquired the principal ownership and controlling interest of "The New York Times," and became its publisher; in 1901 he purchased "The Philadelphia Times"; in July, 1902, he became the proprietor and publisher of "The Philadelphia Public Ledger," and in the following month he consolidated those two Philadelphia newspapers. Ochs was for a time a member of the school committee of Temple Emanu-El, New York. To perpetuate the memory of his father, who was for many years the voluntary minister of the Jewish congregation in Chattanooga, there is now (1904) being erected a temple in that town. National Dictionary of Biography, i. 427.